Callum Paterson and Juanma Delgado should return for Hearts’ Ladbrokes Premiership match with Kilmarnock this weekend. 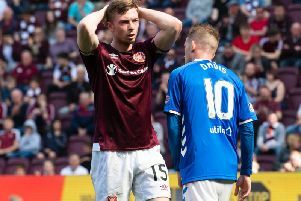 Head coach Robbie Neilson reported that both players were left out of Saturday’s defeat at Dundee United due to tight hamstrings and are expected back on Saturday. Paterson is the Edinburgh club’s first-choice right-back but Jordan McGhee deputised for him at Tannadice. After his red card, McGhee is now suspended when Killie visit Tynecastle. Juanma has an opportunity to cement a permanent starting place in attack with Osman Sow sold to the Chinese club Henan Jianye. Neilson hopes to have both players available this weekend when the new Kilmarnock manager Lee Clark brings his team to Edinburgh. “They’ll be fine. The two of them had hamstring problems from the game on Tuesday but they’ll be fine for this weekend,” said Neilson, who must decide whether Juanma, Gavin Reilly or Abiola Dauda should start up front. The head coach could decide on any two of the above with Hearts looking to bounce back from two successive defeats. He explained that Dauda is still adapting to Scottish football after arriving on loan from the Dutch club Vitesse Arnhem last month. The Nigerian has still to reach top gear but has shown flashes of his undoubted ability in four appearances so far.